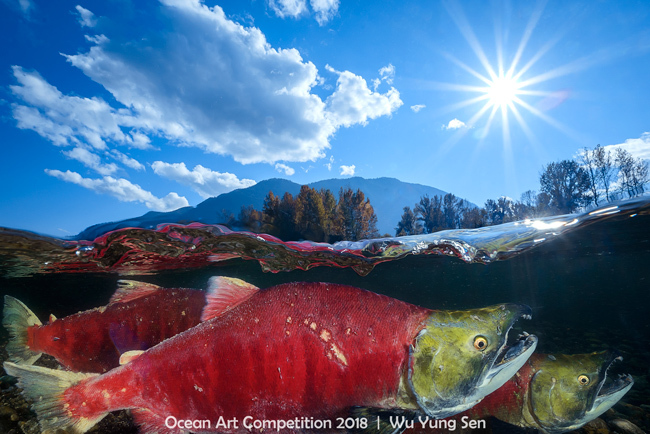 The Story: These Pacific species of salmon will come to the west coast of Canada from the distant sea every autumn. They return to their birthplace by looking for the right salinity of the estuary, the temperature of the river, and the environment of their natal stream. After entering the inland river, salmon have a long journey up the river. In addition to the Sockeye, you can also see other Coho, Chum, and Chinook salmon from the Pacific Ocean. Salmon don’t eat or drink water for 800 kilometers in three months. They arrive ruined and dying. Exhausting the only force they have left, the salmon parents died after spawning and fertilization, with the most important mission of this life finally completed. Location: Adams River, British Columbia, Canada.